Nate is now a Tropical Depression, but it still has winds of 35 MPH and gusts up to 50 MPH. For the interior southeast, that will be strong enough to cause widespread power outages. Very heavy rain continues to fall across Alabama, Georgia and Mississippi. Thankfully with a fast forward speed, we won’t see widespread freshwater flooding. The storm surge was significant in Biloxi when the hurricane made landfall – inundating the first floors of building adjacent to the water. We will have to wait and see if Nate turns into another BILLION dollar disaster. According to a study released by the National Centers for Environmental Information, the United States has experienced at LEAST 218 billion dollar disasters since 1980. WOW! That’s an average over more than 5 per year! This year we’ve already seen three major US hurricanes that have caused more than $1 billion in damages (not taking into account Nate): Harvey, Irma and Maria. None of those storms have a total dollar amount yet. 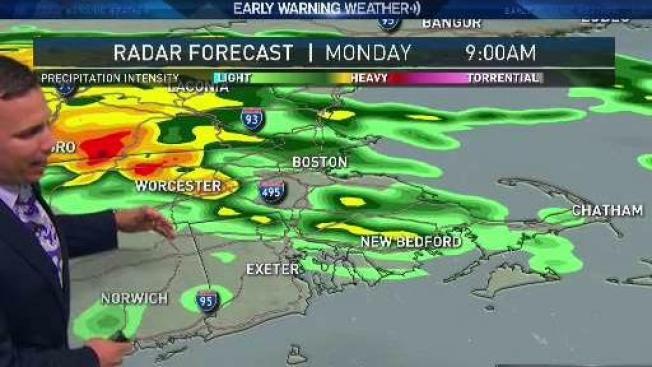 Hopefully Nate won’t cause any more damage, but it will deliver us (New England) a soaking rain. A round of tropical downpours will move through after midnight. Additional heavy rain is possible Monday afternoon and evening. 1-2” of rain is likely with localized amounts of 3” possible. Winds will be gusty as well – 20-30 MPH during the day and evening Monday. A damaging wind gust or even isolated tornado is possible along the South Coast late Monday. Once the remnants of Nate move out, we will get a break from the humidity. It’s been very warm and humid this holiday weekend. We will see sunshine return on Tuesday as temperatures climb to 80°. Humidity levels drop by late Tuesday afternoon. Temperatures will cool back into the 60s by the middle of the week. Average temperatures will stick around into the weekend. After Monday night, most of the extended stretch will be mainly dry.